The two candidates who ran in the midterm elections and are tied to a secretive donor club cofounded by liberal billionaire George Soros were both defeated. Scott Wallace, who challenged Republican incumbent Brian Fitzpatrick in Pennsylvania's First Congressional District, is a partner in the Democracy Alliance, the largest left-wing group of donors who have combined to pour more than $500 million into the coffers of progressive organizations since 2005. Wallace inherited a fortune after his grandfather's company was sold for $10 billion. Wallace runs the Wallace Global Fund, his family's foundation, that reports $150 million in assets and has given millions to radical left-wing groups throughout the years—all of which haunted Wallace on the campaign trail. The Democracy Alliance strives to keep its membership rolls hidden but the Free Beacon discovered a confidential memorandum that was sent to Minority Leader Nancy Pelosi in 2013 that lists Wallace as a partner in the alliance. Additionally, each year the alliance tends to hold two investment conferences—one in the spring and the other in the fall—where the deep-pocketed donors meet up to discuss upcoming strategy for Democrats. 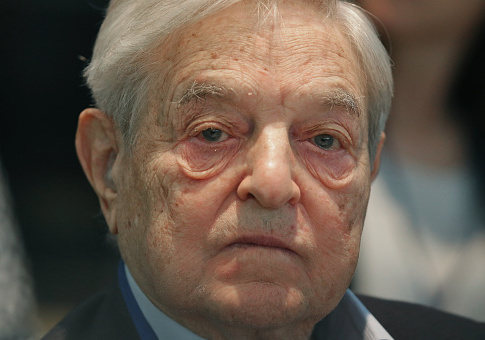 The Free Beacon was on site for the network's fall investment conference last year at the La Costa Resort in Carlsbad, Calif., and obtained a number of documents, including one showing that Wallace and his wife Christy cosponsored a session alongside Soros on funding district attorney races across the country. The retreat was headlined by speeches from Pelosi and Soros. Wallace was born in Bucks County, Pa., but moved away from the area decades ago—living in South Africa while maintaining residency in Maryland—before moving back to challenge Fitzpatrick, a former FBI agent, in what was Pennsylvania's only toss-up election this cycle. Wallace used millions from his own wealth to fuel his candidacy and received little in the ways of contributions from individuals. Soros, Soros's son, and a number of Democracy Alliance board members donated to Wallace's campaign. Fitzpatrick defeated Wallace by 8,000 votes—just under 3 percentage points, 51.3 percent (168,841 votes) to Wallace's 48.7 percent (160,098 votes). Pennsylvania’s former Democratic governor Ed Rendell said Wallace was a "flawed" candidate and that the "most devastating" part of the campaign was when audio sent to the Free Beacon was published in late October, in which Wallace says, "dogs are smarter than police officers." Stacey Abrams, the Democratic candidate for governor in Georgia, is also tied to the Democracy Alliance and appeared at the group's spring gathering this year in Atlanta. During that conference, the Free Beacon obtained documents including an invitation to an event headlined by Abrams, in which dream scenarios were touted, including reparations. "It's 2022 and we are celebrating policy victories across the nation: Medicare for All and Free College, and next on the agenda is Reparations," the invitation reads. "Take a ride in our time machine to hear from the true political geniuses who made this happen," it says. Abrams headlined the event and the group predicted she would "set the course for a new wave of leaders." Republican Brian Kemp narrowly defeated Abrams, 50.3 percent (1,973,395 votes) to 48.7 percent (1,910,395). Abrams, however, currently refuses to concede. The Democracy Alliance also counts environmentalist Tom Steyer, the leader of the campaign to impeach Trump, and other prominent liberals such as Mary Kay Henry, the president of the Service Employees International Union, as members. The group could not be reached for comment. This entry was posted in Politics and tagged 2018 Election, Democracy Alliance, George Soros, Scott Wallace, Stacey Abrams. Bookmark the permalink.